Ida Mae Jones's biggest dream is to fly. Being happiest in an airplane, she has wanted to fly since she was a child. And there wouldn't be a problem, if she weren't living in the segregated South. No one would give her a license for two reasons: She's Black, and she's a woman. When the USA enters WWII, Ida's brother heads off to serve in the Army, leaving his family behind. An Air Force group is formed, known as the Women Airforce Service Pilots, or WASP for short. Ida wants to sign up, but would they hire a Black woman? Probably not, except Ida has skin fair enough so she might be able to "pass" as white. So she decides to sign up to be a WASP, and do what she's always wanted to do: fly. She's accepted, but from the moment she leaves home, Ida is scared that someone will see that she is Black. When Ida and the rest of the women arrive at Avenger Field, they are told that the 5-month training course won't be easy, and that about two-thirds of them will wash out by the end of the course. Ida immediately makes two new friends, Pasty Kake and Lily Lowenstein. Throughout their training, these girls help each other out the best they can. Two days after their arrival, there is the first sign that this course would be hard: two candidates wash out. One or two days later, after a flight test, another woman washes out. The trainees are dropping like flies. Ida, still worried that someone would notice that her skin tone is a bit darker than everyone else's, has had the good fortune to do well and pass, but how long will her luck last? Will she become a full fledged WASP? Or will she be discovered? She doesn't like pretending to be someone she's not. She doesn't like to lie, even if lying helps her pursue her dream. Deep inside, she feels like she is denying that she is related to the rest of her family by denying her race. Not even the WASP friends she makes know her secret. WASP was a real program put into place during WWII, a time when most men didn't like to see women in the Army, Navy, or Air Force. It was also a time when women were finally beginning to prove those men wrong. Not all women back then wanted to live a life in the kitchen. Some of them wanted to get out of the house, to see the world. And some of them did. This historical fiction novel is great for any age able to read a 275-page book, but parents out there should know that there is some discussion in the book of female development (menstruation, pregnancy). Ida Mae Jones teaches us that neither race nor gender should keep you from doing what you dream about. But she also teaches us that feeling forced to be something we're not, denying our identity, can be painful. Daddy's afterthoughts: Mulan, Yentl, Tootsie, and Terri Griffith (a nod to Just One of the Guys, the cult-classic 80s teen romp directed by my cousin, Lisa Gottlieb). All stories where the stars swap gender to achieve some purpose denied them by some stereotype. But switching races? That's a far sight tougher to pull off: Exhibit #1, 1986's vomit-inducing Soul Man. But I am in no position to judge. I don't know that I could ever appreciate the soul-sucking calculus that goes into the decision of having to decide to "pass," to deny everything that you are just to get by. 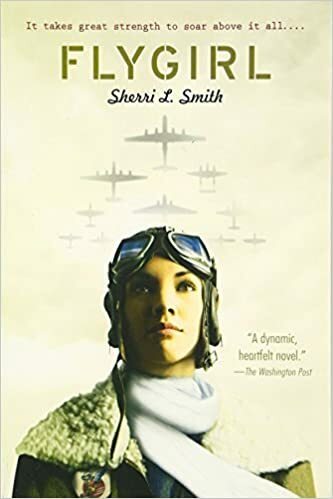 Ida Mae's decision is on the surface a pragmatic, utilitarian one, and too quick a read of this book will make it seem like the story is all about her achieving her dream of flying, when that storyline is really a vehicle for the novel's heavier load: complex and overlapping themes of identity and family. Case in point: The scene where Ida Mae's (darker-skinned) mother shows up at the base, and Ida Mae keeps from blowing her cover by pretending that her mother is the maid may seem like a minor plot point if the reader's main focus is Ida Mae's flight aspirations, but a second read of the book, with the reader's attention focused on the novel's deeper themes, reveals this moment to be one of the most heart-rending in the book.